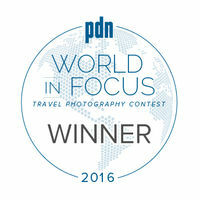 One of my images was chosen as a winner in the Travel Portrait category. I've been shortlisted as a finalist for the Travel Photographer of the Year award. Fingers crossed! StudioVox featured my portrait work today, including a short interview with me. Smithsonian chose another of my images as their "photo of the day" today. I normally wouldn't highlight a photo of the day... but it is Smithsonian, so thought it was worth mentioning. I was shooting portraits in a small village in China and spotted this girl looking over like she wanted her picture taken too. She turned out to be one of my best portrait subjects of the trip and really enjoyed herself! I have finished processing my images from Death Valley, so please check my Southwest folder for those. Also, I have some upcoming travel, so please check back for new images from India, China and Colombia before the Summer is through. I would normally not post a Photo of the Day as news, but this is the Smithsonian! :) Thanks to Smithsonian for selecting my picture! I have finished up processing my Indonesia images. I spent time learning from the amazing Rarindra Prakarsa during this trip and learned a lot about taking and processing portraits from a true master. I definitely plan on returning to Indonesia and also doing more of these types of portraits. I just returned from 8 days in Indonesia. While there, I had the good fortune of being able to take pictures with awesome Indonesian photographer Rarindra Prakarsa. I've begun uploading new images from the trip, so check back in the coming weeks to see new images. I just returned from four days in the Great Smoky Mountains with good friend and photographer Dusty Doddridge. I had a blast and got some great images. I just uploaded the first picture to my Eastern U.S. gallery and will continue to add additional images during the upcoming days and weeks. I have finished posting images from my July trip to France, which are now available in the France gallery. I've finished processing my Pacific Northwest images, so please have a look. Next up, lavender fields of southern France. So, there is a lot coming up in terms of photography. Will hopefully be adding some nice images to the portfolio in the next 12 months. I have learned a great deal from other photographers who are more experienced in some aspect of photography than I am. Last month, I had the opportunity to spend 9 days with the highly talented Marc Adamus and a small group of photographers in Washington and Oregon. It was truly an amazing experience. In the upcoming weeks, I'll be sorting through and processing those images. Check back with my Pacific Northwest folder every few days to follow my progress. June 20, 2013: New Website! I have a brand new website designed and built by WideRange Galleries. Jack Brauer and his team were responsive and thorough in addressing all questions throughout the entire process. I highly recommend WideRange Galleries as a developer of photography website solutions. Along with the new site is a new blog that I’ll be posting to regularly. I will re-post some of my older articles on the new site, so you may notice a few repeats if you’ve been following the blog for awhile.